Preserved 1979 626 on BoT! It's in Poland, though. Darn. Darn nice car that! Sadly, I don't have $25K AUD plus shipping, to spend on it! Yeah, it is waaaaay overpriced, even if it's basically perfect. Though maybe because it's got to be extremely rare in Poland, the price is justified. According to BoT, this car belongs to a big collection of delivery mileage only Mazdas from the 80s for sale in Poland. Eight... EIGHT mid-80s 323's looking in perfect condition. And, even better, a mid-80's 626 in perfect nick. And, lastly, most awesomely, TWO MORE 1979 626's, again in perfect condition! One of them's even my car's colour!!! Who kept this stuff??? So let us once again sit from afar and drool at these wonder machines... Somebody ought to get a hold of the Mazda Museum in Hiroshima. Beautiful. 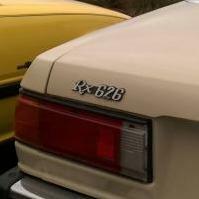 I love the 323's - they've mostly disappeared from the roads here in Australia, and before they vanished the majority of them looked like they were stuffed.